The joyous preparation began on Wednesday and Friday evening as the church school children gathered to make 250 Badjnici ( little badjnak branches tied with straw and Serbian “trobojan” which were given to the faithful on badjne vece. Braving the winter chill, the children, lead in procession by Father Milorad, carried the badjnak into the church while singing "O' Badnjace". The children then decorated the Badjnak with ribbons and ornaments they made during Advent. 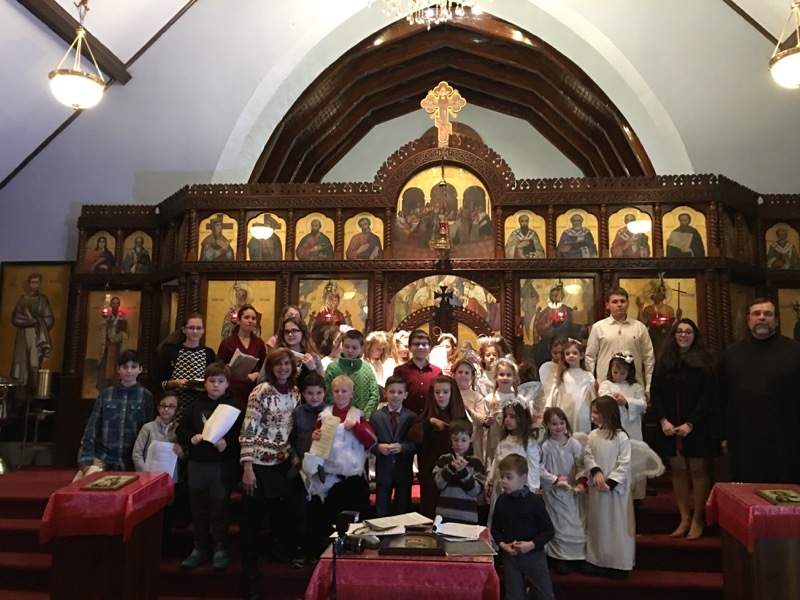 following the Blessing of the Badjnak and the cesnica, the Children presented their Christmas program “for unto us a child is born”. 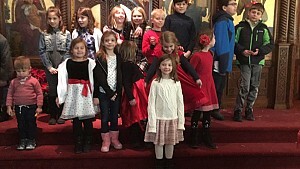 The program featured Readings of the Nativity story, from Blagovesti( Annunciation) to Christ’s Nativity, as well as songs beautifully sung by the parish children. The children learned traditional Serbian Songs of Bozic, Bozic Blagi dan, Zvezda se Zajsia , O Radosne vesti, Andjeo Pevaju, as well as Mario Slavna, Zvuchna Zvona, and Zvona zvone. The traditional burning of the badjnak took place following the Christmas vigil service. Following the greeting of "Hristos se Rodi" the joyous celebration continued in the social hall where the faithful gathered in the for a treat of homemade krofnje. Snezena Baradakas has for many years donated her time every badjne vece to make the krofnje for the parish. Joined this year by Milena Jurcak and Mira Bratic , they prepared over 300 from scratch. The children celebrated with the traditional search for coins and candy in the straw. A joyous and blessed evening was had by all.